Please let me begin by offering my thanks to the organisers and to our hosts for honouring me with an invitation to the 10th Anniversary Conference of one of the world’s great film festivals, The International Women’s Film Festival in Seoul. I am especially grateful to be in the company of the distinguished film scholars and filmmakers speaking here today, since my own relation now to ‘cine-feminism’ is somewhat indirect. Certainly, I began my working life in the late 1970s as a feminist film critic, writing both for mainstream and for women’s movement newspapers in Australia, and I was actively involved with independent film activities throughout the ‘80s. Today, though, the mode of institutional support that I am fully involved with in Hong Kong is education, in particular, university teaching and research-network building: work which helps to shape audiences for women’s cinema, but also, in the context of Lingnan University (an undergraduate-oriented liberal arts university), to train not only future teachers, curators, critics, historians, and social activists but also market researchers, advertisers, and arts entrepreneurs whose work may support, interact with or even coincide with women’s cinema. Given the ‘anniversary’ aspect of our Conference – ten years, a cause for celebration and an occasion for historical reflection – I have chosen to look back a little at my experience of the work of institutional support; and I will focus on something that strikes me (more so with every passing year) as profoundly important in practice, namely: the pragmatic, survival-oriented, and world-changing energy of being ‘festive’, or, as Australians put it, of ‘having a good time’. So I must end these introductory remarks with two special thanks: first, to Park MiYoung, for working so hard to make me cheerful about writing this paper, and to my colleague at Lingnan, the film director Yau Ching (who is very familiar with this festival) for advising me to offer something that might give a sense of hope. 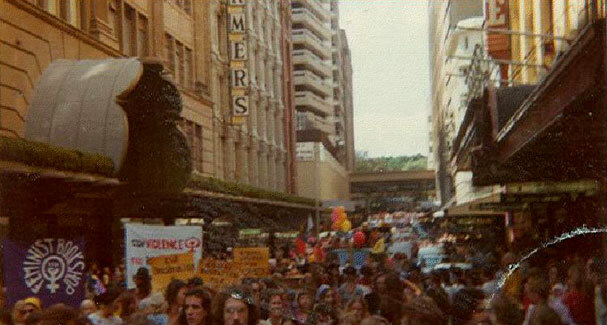 Here, captured perhaps as only photography can, is an image of a historical moment of hope that surged up in Sydney 40 years ago: one of the first public demonstrations by a small, mixed group then generally calling itself ‘Gay Liberation’, and separating from a slightly older, rights-oriented group called CAMP INK. The hefty lass in the hat is me, and along with the memory of joy and hope, I feel a deep sense of poignancy as well as a bit of disconnection when I look at this image; many of these men died early in the HIV-AIDS epidemic, which in Australia struck gay men first, and, as lives over time take different paths, I don’t know what became of the women, either. I do know, however, that the festive spirit so deliberately expressed in public at this moment was not only creative but also ‘institutional’ in the special sense that, in interaction with a lot of other people’s festivities and hard work, it ‘instituted’ or began a whole series of events and activities that did change the world for, as we say today, LGBTQ people in Australia. Of course it did not completely transform our society in the ways that people then hoped, but radiating out from each single person, each figure in this photograph, lines of later activity could be drawn that were consequential for, and affected, that society. And in looking at this old photo of courage and hope today, I see in its apparently artless sense of festivity (which was, of course, carefully planned), the very thing that the filmmaker and scholar Laleen Jayamanne calls ‘an enabling tradition’. She uses this phrase in her essay on the film Night Cries: A Rural Tragedy (1989) by the Aboriginal Australian artist, Tracey Moffatt. Jayamanne is thinking of how women and indigenous filmmakers endow themselves with predecessors, with ancestors, with a ‘tradition’ that helps them to act. In a beautiful example from Korean women’s cinema, this is what Kim Soyoung does with women’s eulogy-writing in her film Koryu (2000). And I would like to borrow this phrase here to say that we need to make ‘enabling traditions’ for our institutional as well as for artistic and critical work, in cinema as in feminism. 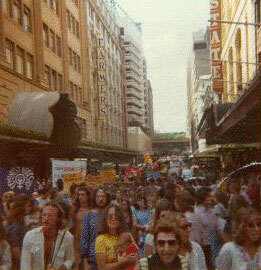 International Women’s Day, Sydney, 1975. Institutions in Market St: Department Store (Farmer’s); Cinema (State Theatre); Feminist Bookshop (marching in the street). Yet let me pull back, with historical hindsight, to notice the institutions literally framing our demonstration and participating in it! This is Market Street in downtown Sydney; on the left hand side is a then famous ‘shopping institution’, Farmer’s Department Store, now much altered; the site today is occupied by Myers, another shopping complex. On your right is the State Cinema, a fine old ‘picture [= film] palace’ which still stands and is strongly associated with the Sydney Film Festival – the supportive institutional site for many a feminist film forum for thirty years after this photo was taken. So much for place, and for enduring, stabilising things (although anyone who has worked in the retail industry or in film exhibition and festival organisation can instantly remind us just how fragile and unstable such ‘landmark’ institutions can be). On the street, though, in movement between the consumption palace and the movie palace, are the festive and protest banners of Women’s Liberation; prominent among them, on the left of the image, that of the Feminist Bookshop: then barely a year old, but still selling books until quite recently. 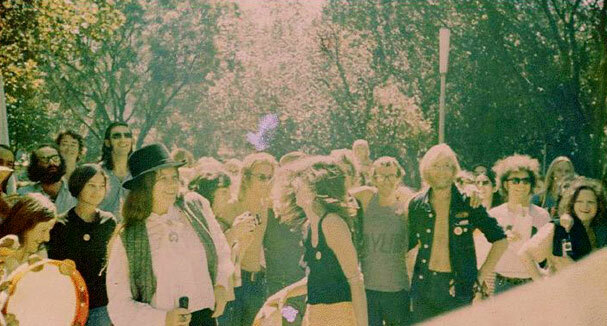 When does a movement become an institution? Looking now at images of old demonstrations it’s easy to ask this question – perhaps especially of feminist movements, which do tend to gather for younger activists and ‘newer’ movements a stifling weight and a sense of being ‘set in their ways’ that is commensurate with the relative success of feminism as a long duration, enormously diversified, political force. But to give useful answers to this question, answers that we can use in a positive spirit – and here I approach the topic of our panel, ‘the sustainabilities of women’s cinema’ – I think that we need also to ask how institutions can sustain and nurture movements. They do not necessarily do so; we know this. Yet institutions are not only the big, deeply anchored, conservative structuring forces of any society. They can also be (and I’m quoting the Australian Macquarie Dictionary here) any ‘organisation or establishment for the promotion of a particular object, usually one for some public, educational, charitable, or similar purpose’ – a purpose like sustaining women’s cinema, let’s say. And ‘institution’ can also mean ‘an organised pattern of group behaviour, well-established and accepted as a fundamental part of a culture’. (Like the assumption prevailing in Australia when I was young that nice, marriageable girls don’t smoke; our challenge to which led many of my generation into a lifelong struggle with addiction!). Gillian Leahy (right), director of Doled Out (1978), My Life Without Steve (1986), Our Park (1998). So if I ask what has been most ‘enabling’ for me in this publicly festive ‘tradition’ of mobilisation that I have been invoking, I find answers less in the wide-screen, objective image of a political movement than in the moments of intimacy, eventfulness, happiness, and contemplation that always, but always, occur not on the ‘margins’ of a big historic event, but at its very heart. 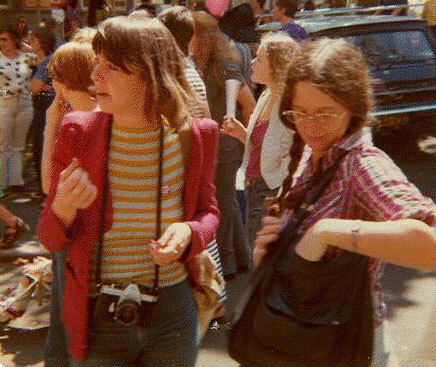 The young woman gazing thoughtfully on the right of this picture (again, Women’s Day March in 1975) is Gillian Leahy, then an undergraduate in anthropology, who soon began training at a new institution, the Australian Film, Television and Radio School. She has since directed over sixteen films, ranging in length from ten to fifty-five minutes. Many of her films are documentaries about a wide range of activist issues from youth unemployment to residents’ action and urban development conflicts; her work in fiction explores actual events. My hindsight here is highly personal, but not (I think) eccentric, when I say that to me, this snapshot of a woman looking in the street, in the crowd, involved as events develop – to me, this is an image of a key sustaining principle of ‘women’s cinema’: festivity and contemplation, creativity and realism, together. 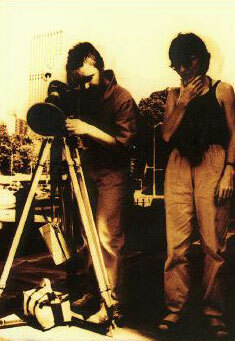 Helen Grace (left) and Erika Addis shooting Serious Undertakings, Sydney, 1982. Photo by Sandy Edwards, courtesy of Helen Grace. And here’s another version, filmmakers Helen Grace and Erika Addis shooting in the city a key Australian feminist ‘short’ of the 1980s, Serious Undertakings (1983). What principle do I have in mind here? Not literally ‘being in the street’, when so much that is beautiful and energising now comes to life for us in and through computers and other more or less portable technologies. Rather, I mean that ‘women’s cinema’ is at its most creative when it is working not only on ‘women’s issues’ narrowly defined, but in the midst of all the going issues of a community, a city or a nation, and when it exemplifies an engaged kind of social embeddedness – a kind of engagement that can lead (as it did for Gillian and for me, among many others) to the creation of those institutions-with-a-small-‘i’ (film societies, newspapers, festivals, action groups) that vitally radiate the energy of a moment to other people, in other places and other times. When we let institutions make classifications for us, we lose some independence we might have had. We build institutions ourselves, squeezing new ideas into a common, familiar shape. 1. See Mary Douglas, How Institutions Think (London: Routledge, 2011). Amongst them, these three points sum up difficulties and dangers that will be familiar to anyone involved with sustaining women’s cinema, whether against suppression and censorship at one end of a spectrum of threats, or against commodity boredom and imaginative death at the other end. The first two features of institutional thinking are well known in their negative versions: let’s call these ‘loss of imaginative independence’ and ‘pressure to conform’. In the 1980s and ‘90s in countries like Australia, where the state was willing and able to establish both cultural policy frameworks and film funding bodies to foster local production, many filmmakers fell into what Helen Grace calls ‘Development Hell’: a suffering cycle of repeatedly applying to Development funds and redrafting scripts to please committees and boards, only to find the project rejected once again because of bureaucratically defined ‘flaws’ (for example, not being similar enough to an existing film with a record of critical or even financial success; a.k.a., ‘track record’). In institutional life there are many circles of Hell, and to Development I would add (from my experience) Managerial Hell, Cynicism Hell, Political Correctness Hell, and Burn-out Hell. However, it is possible to flip these two features of institutional thought into positive modes. Looking carefully at Douglas’ words, we can see that loss of independence occurs when we let institutions do the thinking for us; we can, instead, change the ways in which institutions do their work of ‘classifying’ and administering social realities. The long, honourable history of pragmatic political reformism has this task at heart. Second, ‘squeezing new ideas into a common, familiar shape’ does not necessarily mean co-optation or conformity; it is what we do when we aim for accessibility and non-elitist community-building, and it is also what we do when we teach – particularly, when we teach by telling stories. The new is not always lost in such ‘squeezing’ because (unlike putting old wine in new bottles, but a lot like struggling into clothing that no longer fits), there is always something left over, something added, that transforms the whole. That said, I think the ambiguity of institutions is best captured by the third feature listed here: the narcissism with which they value their own ways of working. Women entering male-dominated institutions have always encountered this institutional self-love, but feminist institutions can suffer and stagnate from it too. 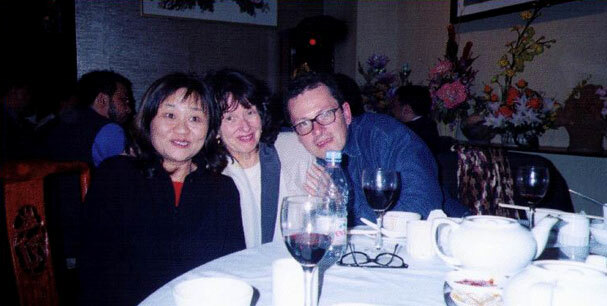 Kim Soyoung, director of Women’s History Trilogy (2004), with Meaghan Morris & Adrian Martin, LOLA co-editor. How then should we ‘inhabit’ these institutions that sustain our work, while at the same time confronting us daily with both the ‘circles of Hell’ and the paralysing temptations of ‘bad’ narcissism, i.e., a self-regarding closure? Here I want to give a serious meaning to what I’ve called the festive principle in institutional life. As an event organiser myself I have always known its importance; in the most hard-headed, practical way, you must plan in detail for people to enjoy themselves if you hope to generate political and cultural energy, and this is often the most arduous, painful part of your organisational labour. However I only began to think seriously about this when I started looking for images of women filmmakers ‘snapped’ at moments of ‘engaged social embeddedness’, and I found that all those I have personally from the past 8 years in Asia so heavily feature food! 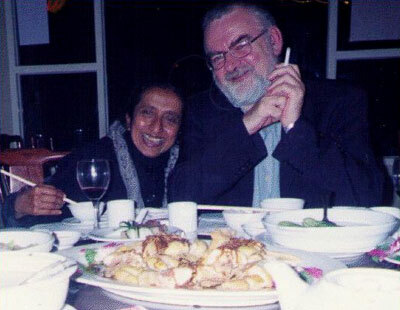 Laleen Jayamanne, director of A Song of Ceylon (1985) with Paul Willemen (1944-2012), author of Looks and Frictions, supported women’s cinema at the British Film Institute 1976-1995. S.V. 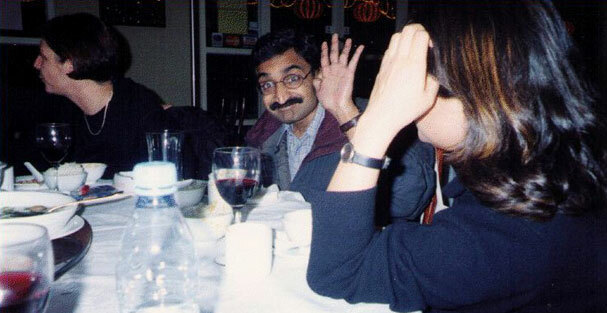 Srinivas, film historian and ‘world’s only expert on Telugu cinema’, with Kim Soyoung, Hong Kong Connections conference, Lingnan University, 2003. The festive principle: Laleen Jayamanne with Adrian Martin. These images are different in some ways from those I showed before. Except for the Helen Grace production shot they’re all ‘private’ in the sense that they were taken for purposes of personal memory and celebration. 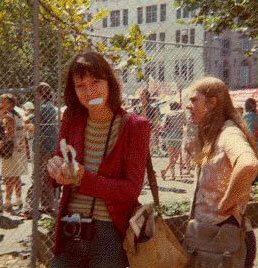 But the demonstration photos from the ‘70s also record events that were in themselves staged to be seen. The festive principle at work and of enduring importance here is one of showing not only the collective solidarity of a marginalised group but also their happiness, joy, and beauty in being together: that is why this kind of festivity is also a ‘show of strength’. The more recent ‘food photos’ were not taken to be seen like this, and they’re like family photos. Set in restaurants, rather than the street, and focussing on the group rather than the crowd, they also celebrate the public institution of the conference (like our gathering today), and the more intimate festive principle of hospitality. Framed by an individual life, this shift from the 1970s to the ‘80s could be read chronologically as a story of feminist embourgeoisement, a withdrawal from mass struggle to cloistered zones of privilege, and in my case that would be broadly true! A mass mobilisation of photographers? But it is also misleading, because what I would ask you to consider is the vast archive of festive ‘family photos’ – some based on actual kinship, others featuring (like mine), families based on alliance and affinity – that would spread before you if you could simultaneously see all the photos taken that day by all of the people with cameras here, and all of their subsequent photos of moments somehow touched or launched by participating in this march. So, without denying historical change, I would see these two modes of festivity – exhibition (the public show of strength) and hospitality (intimate care of the self and of others) – as co-existing and interacting across time, and as vitally sustaining (supporting and nourishing) women’s institutional work. There are other modes, of course! But all of them take a lot of planning, organising, rescuing when things threaten to go wrong; all the hard, gruelling and (if we are not careful with ourselves) embittering labour of love. 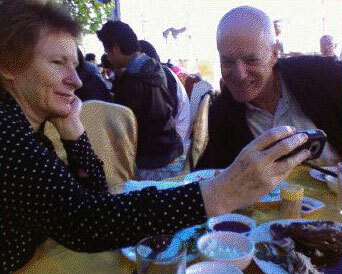 Helen Grace, ex-Hong Kong-based digital artist and academic, with André Frankovits, human rights activist, Sai Kung, 2007. And thus, for me, the festive principle in institutional work is a political principle which manoeuvres between the harsh ‘reality principle’ which institutions are dedicated to reproducing, and the ‘pleasure principle’ which alone (I think) can over the historical long term sustain the ‘good’ narcissism of collective self-love and shared self-respect that social movements must affirm if they are to flourish. The festive principle can be consumed by the energy and power of either of these forces, and it can be destroyed when they come into conflict – as they often have in the history of women’s movements. But when it succeeds in drawing strength from both, the festive principle has a unique force of its own that I would call the pragmatic creation of joy. So these food photos represent an enabling tradition, too. 2. Ashish Rajadhyaksha and Kim Soyoung, ‘Introduction: Imagining the Cinema Anew’, Inter-Asia Cultural Studies, Vol 4 No 1 (2003), pp. 7-9. 3. Kim Soyoung, ‘The Birth of the Local Feminist Sphere in the Global Era: “Transcinema” and Yosongjang’, Inter-Asia Cultural Studies, Vol 4 No 1 (2003), pp. 10-24. Within this framework, I would add the possibility of making festive use of state institutions as one of the ways in which we work for alternative public spheres, cinematic and otherwise. I have no time here to reflect on the fact that all the women filmmakers whose images I have used are also scholars, writers and teachers: Gill Leahy, Helen Grace, Laleen Jayamanne and Kim Soyoung all work now in universities. So do I, although I did not begin to do so full-time until the year 2000, when I moved to live in Hong Kong. And it is in academic institutions, rapidly globalising in a neo-liberal mode as they are across most of Asia, that we can see what is at stake in ‘sustaining the festive principle’, and its pragmatic, political value. The neo-liberal academy is dedicated to maximising the economic value of research to nations and, increasingly, to corporations, even in the Arts; and to do this, it violently subjects us to time-management disciplines and time-consuming rituals meant to eliminate wasteful moments of pleasure from our everyday working lives. Neo-liberalism is an enemy of the festive principle: we should make no mistake about this. Consider, for example, how the rituals of performance review and contract renewal force out those scholars who are often best at running programmes because they have a genius for hospitality and making other people feel good, but who can’t always churn out refereed articles; or how, as our workloads increase exponentially, we slowly become ruder and more instrumental in our dealings with each other. This must be fought, because that way leads to the Cynicism and Burn-out circles of Hell. 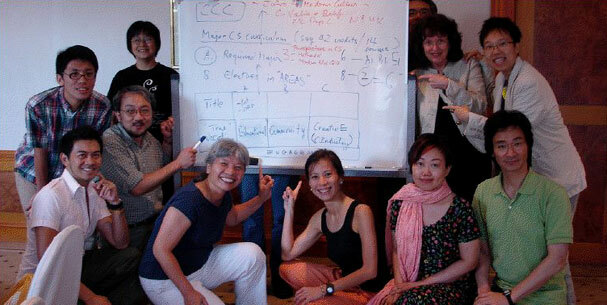 Yau Ching (right), director of Let’s Love Hong Kong (2002): Festive Strategic Planning, Department of Cultural Studies, Lingnan University, Hong Kong 2007. In places like Hong Kong or Taiwan, the roles of film critics and curators are often mixed and interchangeable. Despite the richness of Hong Kong film history, there has been a significant lack of LGBTQ film culture here … I see my writing, my curatorial, and, in fact, my filmmaking activities as mostly motivated by this lack. There are just not that many people in the community who can afford to be out and have the time, resources, and energy to do so much volunteer work. (4) 4. Yau Ching, ‘Bridges and Battles’, GLQ: A Journal of Lesbian and Gay Studies, Vol 12 No 4 (2006), pp. 605-7. Extract here. Along with a sharp definition of the practical needs of a local context there is a sense of obligation here, a commitment to that engaged, social embeddedness that I have tried to describe to you today in this 10th Anniversary festival conference – enabled as this conference has been by the kind of work to which I have wished to pay tribute. Yau Ching calls her article ‘Bridges and Battles’, and I hope I have explained why I see the festive principle not as in contrast with a fighting activism, but precisely as a way of making and taking bridges – and as itself one of the battles to sustain women’s cinema. © Meaghan Morris April 2008.